Like other European based brands, we find Dainese gloves to run a bit on the snug side as compared to most US based brands. The fit is comparable to Alpinestars and REVIT. The tendency to run small is not so noticeable that we’d advise you to buy one size larger, but if you are sometimes in between sizes, your best shot would be to choose larger. Hopefully you’ve had some experience with buying gloves and can choose based upon the fit of a previous pair. If you have no previous experience with glove sizing, go here for help. This glove is offered in sizes down to XXXS for women and youth wear. 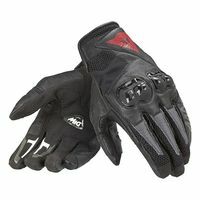 These MIG C2 gloves are a great choice for sport riding in mild to hot weather. They have more armor and better fit than many short cuff gloves in this price range. I really like how these gloves fit! They are snug around the hand and taper nicely to wrist and give the feel of a much more elaborate sport/race glove. And the cost is relatively tame for a European brand. The knuckles have a very substantial protector and there is also a bit of padding the heel of the hand. The side of the pinkie has extra leather and some extra padding which extend all the way down the size of the hand to the wrist. Most of the glove is leather and most of the palm area is Clarino (man made suede) with leather reinforcements. The tops of the fingers have mesh material inserts so I’d expect a lot of air flow through this glove and that’s why I mentioned summer use. The leather between the fingers is punched with a row of holes for venting too. Dainese says: The use of cowhide and mesh fabric makes these certified, ventilated summer gloves resistant yet provides excellent performance characteristics. Comfortable and light Mig C2 gloves were designed for riders who enjoy taking their bikes out for a run on hot and sunny summer days. Thanks to a different layers of cowhide and mesh inserts, these short sports gloves blend ventilation with performance and resistance. The sports look which characterises CE – Category II – Pr-EN 13594/2010 level 1 certified Mig C2 gloves is enhanced by polyurethane knuckle protectors for additional safety.